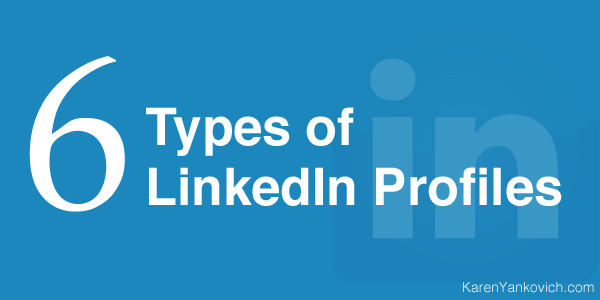 There are 6 LinkedIn Profile “Types”. Which One are You? All LinkedIn profiles are not created equal. Your profile can fall into multiple categories, of course, depending on the situation, time of year, and social media needs of you and your business, but for the most part your profile will hover more squarely in one or another category. Because knowing how you are being perceived is half the battle of your personal branding efforts as well as a HUGE indicator of how successful you will be at what you want to achieve on LinkedIn. One very important similarity between all 6 profiles: they all use their keyword up front and center in their main headline: Entrepreneur, Executive, Seeking, Networking, and Marketing so you know from the get-go exactly who these people are, what they do, and what they want to do. Take a look at your headline right now and make sure it does the same! This is the number one way LinkedIn, Google, and those who search for people with your skills are going to find you and find you fast. Now let’s look at how they are different. The Entrepreneurial Profile can often be found with a long list of publications and projects, from articles to blog posts to books it doesn’t matter. Entrepreneurs need to make their mark by showcasing their expert status in the niche they are trying to break into or niche they are trying to create because much of entrepreneurship is about convincing the rest of us to believe, to follow, and to ultimately buy. These profiles should have (or be on their way to having) 500+ connections. Take a look at this Entrepreneurial profile that lists testimonials in her summary section – an intriguing way to establish trust and social proof! The Executive Profile can be found linking to a CV or resume along with a large experience section that showcases their march to the top. Affiliations and professional organizations are key here as well as a polished professional profile photo. One tip here – take your professional resume and use it as you tackle your LinkedIn profile – fleshing each section out with thoughtful descriptions, headlines, and key words. These summaries are often written in the third person, which is fine if that is the audience you are talking to (however I do always recommend a first person summary for personality and voice) Take a look at this Executive Profile and compare notes. Is your profile an executive profile but lacking in a specific area? The Job Seeker Profile is a very important category on LinkedIn and one of the best most practical uses of LinkedIn is finding that new career you will love. A very important tip to use, if this is where your profile lands, is to keep up on your skills/endorsements section. Make sure the skills listed are topical and relevant to your new field you seek. Keep it professional and strategic. Edit this section just like any other to showcase the top skill set at the top and move the older, outdated skills to the bottom. Ask friends, family and co-workers to endorse you for those top skills and slowly flesh out a new skill set that will cause prospect employers’ eyes to sparkle when they land on your LinkedIn profile. The Networker Profile is a powerful one and we can all take hints from their summary sections. As a rule those that claim “business networking” in their title are connectors and they are here on LinkedIn to do business and to be known. Take a look at this Networker Profile and see how she explodes out of the gate with strong information in her summary that any business person would want to know. Makes you want to read more doesn’t it? The Thought Leader Profile is one of inspiration. LinkedIn has allowed its network (aka you and me) to follow Thought Leaders and their posts. Their profiles are visual, they make use of the new background picture feature, and are often sparse. What they lack in a fleshed out profile they make up for in thoughtful, big idea posts published on a regular basis. While we can’t “follow” in their footsteps by leaving our LinkedIn profile as empty, we can follow their lead by publishing thought-provoking big idea posts about your business why, your personal brand, and your business expertise that add value to your network, intrigue prospect clients, and impress future employers. Take a look at Richard Branson’s Thought Leader Profile and maybe get inspired with a few big ideas of your own! Regardless where your profile falls in this mix always make sure it is clean, polished and professional as well as up to date! A good looking LinkedIn profile will serve you well now, and far into a successful 2015. For additional tips and inspiration click here to read an article where the author showcases many suggestions I constantly preach to you about your LinkedIn profile and I think it not only serves job-seekers as the title suggests, but all categories I’ve mentioned here today. Have a question, thought or idea and not sure how to proceed with polishing your profile? Join me in my LinkedIn group – click here – and ask away!